Have you ever thought about the journey of your clothing? The shirt you’re wearing for example, what sort of life has it led? It probably started as a new, young fiber, until it was one day woven into fabric. It then took its first trip overseas to a factory, where it was cut and sewn into a garment. From there, it travelled again, this time to be dyed or printed or have its labels sewn in. Your jet setting shirt likely crossed yet, another ocean, this time to be put on display in a store and hopefully sold to someone who would give it a nice home. What happens next? What’s next on your shirt’s journey when you’ve worn it out? Does it get thrown in the trash, to spend the rest of its days rotting in a landfill? Is it donated to a local charity shop, where a new owner will discover it and appreciate all it still has left to offer? What happens to the nearly 30 billion pounds of discarded clothing every year? Only about 15% (or 4.75 billion pounds) is donated...the remainder is sent to landfills. While we could discuss what happens to clothing when it is buried under scrap metal and hungry seagulls, our time today is intended to look at the pieces that end up on the racks of your local goodwill, or shipped overseas to underdeveloped countries. Some our clothing travels internationally more than most passport holders. Here’s how it works; when you donate your clothing to your local charity shop or donation bin, chances are it goes to a sorting center. There, it is separated into one of three categories: (1) to be sold in the US, (2) to be reused as commercial rags, carpet padding or insulation, (3) to be bundled, sold and exported to underdeveloped countries. It’s an ongoing debate whether or not it is beneficial to economies abroad who purchase our second hand clothing. On one hand, vendors, tailors, truck drivers and small business owners rely on the second hand market for their livelihood. It also allows those in lower socioeconomic classes to afford, otherwise unattainable, ‘new-to-them’ clothing. On the other hand, the amount of second hand clothing being exported has drastically increased, due to increased consumption in developed nations, specifically the US and Europe. Many of these countries are burdened with large quantities of clothing, which can’t be resold due to its poor quality. (Remember, the clothing being shipped abroad is deemed ‘unwearable’, otherwise it would be kept and sold in the US). By flooding the market with cheap, used clothing, it also often kills the local textile industry. Why continue making your own fabrics and clothing, when you can buy someone else’s for less? 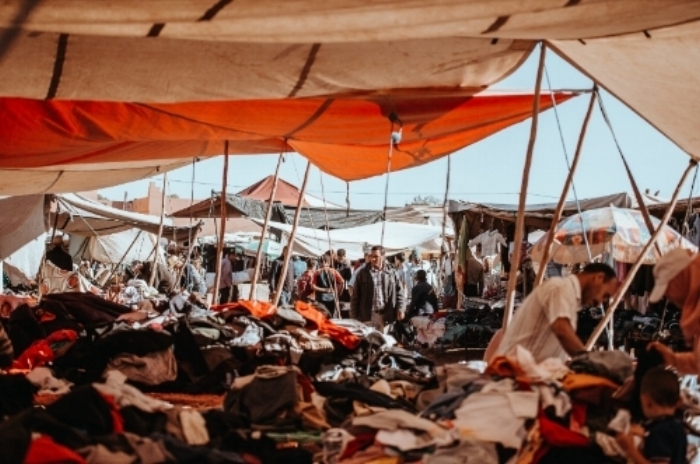 Regardless of your opinion on whether or not our used clothing should be sent abroad, there is no denying that we discard more clothing than our planet and it’s occupants can manage. There are simple things we can do to help. Consume less and research more. Before you donate, learn where your charity of choice sends their clothing. If possible, find local nonprofits or organizations that can use your second hand clothing locally. If we choose to continue to shop and consume, it is our responsibility to find sustainable ways to dispose of our old goods.